Faced with a storage room holding over 300,000 files, our client, a Midlands-based law firm, were facing major difficulties. As well as running out of office space, they were spending far too long locating client files for each case. They told us the problem was so severe that they could spend two hours searching for a file, only to find it had been booked out by another lawyer. They were also worried that, without a records management system in place, they could fall foul of the Data Protection Act. We drew up plans for a paperless solution which involved scanning each live client file and uploading to our secure imaging web-portal, tailoring the imaging to suit their requirements. This would make hunting for files a thing of the past, allowing solicitors to bring up records on their desktop in just a couple of clicks. The new electronic system also means staff can work on cases anywhere they have internet access, and that more than one person can view a file at the same time. We have completely transformed their archiving operations and as a result, have helped the firm make large cost and efficiency savings. Now they can retrieve files quickly, their service has improved, as they’re able to send information to clients more quickly. They have significantly reduced staffing costs and are now a lot more organised in how they manage day-to-day information. Their back office is now tidy, with employees working in space that was previously taken up with storage. 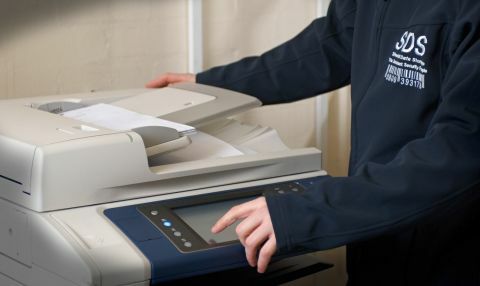 If you're interested in our document scanning services, get in touch with us today or fill out the form below for a quick quote.